Keep the Hero By Night Universe at your fingertips by adding these digital editions to your favorite e-readers and devices. THANKS TO ALL OF OUR KICKSTARTER BACKERS, OUR FUTURE DIGITAL EDITIONS AND ALL BACK ISSUES WILL NOW BE FREE TO DOWNLOAD! - We are currently in the process or reformating some back issues and finding a better way to have these available for you to download for free! 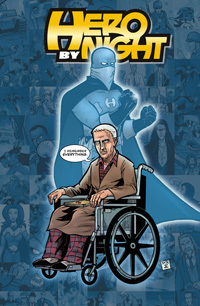 Please join our Hero-Gram newsletter to get alerts for new free comic downloads! The new adventures begin here. Will Jack become the new Hero, or ruin his relationship and doom the planet? Meanwhile, the original Hero is waking from his hiatus. It's a race against the clock as Hero takes on the return of SAUL SIMIAN! Will he be able to juggle his personal life and being a hero? Find out in this action packed issue! David Day remembers everything while Jack battles Saul Simian in round two. Unexpected surprises inside this pivotal issue. Other merchandise coming soon. Want something specific? 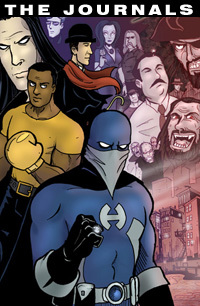 Let us know on the Hero By Night fan page. WHAT IS "DIGITAL DELUXE EDITIONS"? From issue 4 on, we will be distributing "digital deluxe" editions of our comic. This format allows more reader control over the pacing of the story and allows us to experiment more with the language of comics! Digital Deluxe also allows us to add in clickable buttons to added content or features without bells and whistles you see in motion comics or flash players. We feel this is truly the future of comics in your hands today! We're excited to be able to offer a 99screen story for as little as 99cents! What format are your digital comics in? Our digital issues are enhanced PDFs. They will work on all of your digital devices as well as readable on your home computers. With our new "Digital Deluxe" editions we're adding some cool interactive elements as well. How do I view a PDF on my iPad or iPhone? It's easy! Just plug your device into iTunes and drag and drop any PDF comic files into the "BOOKS" section. Simply select the books you want to sync to your device and they will appear inside the iBooks app of your iPad or iPhone. If you don't see it right away on the bookshelf, don't panic! Just click on your "collections" tab and switch to your PDF collection. If you're on an iPad and click the download link for your PDF it should also download it in your browser and will prompt you asking if you'd like to open in iBooks or Other PDF reader apps you may have installed. Can I read your digital comics on the Kindle? 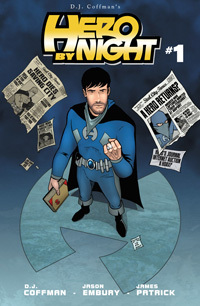 You can read our digital comics on the Kindle Fire. We are not currently available on the Amazon store. 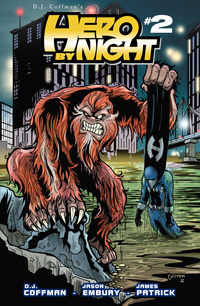 You can only buy digital Hero By Night direct from us, the creators! It's also the way we can keep our prices so affordable for you!